What is Valentine's Day without a heart treat or two? These simple homemade heart desserts are guaranteed to bring a smile to Valentine's face. 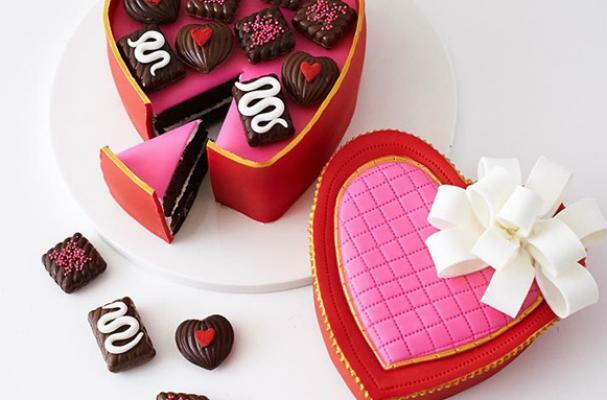 Whether you want to keep things simple with white chocolate hearts with a gummy center or show off your extravagant cake decorating skills with the candy box cake, there is a recipe for every skill level. Meringue cookies are a light as air dessert made from a combination of egg whites and sugar. The batter is poured into a pastry bag and piped directly onto a baking sheet in a heart shape. Once baked, it is filled with marscapone cheese and decorated with lovely red raspberries. Valentine's Day candy pops are quick and easy treat to make for all the special people in your life. Two mini candy canes are brought together with pink candy melts. You can decorate these pops with red, white and pink heart sprinkles or jimmies. I like to wrap them up in individual bags and give them out as gifts. Chocolate is a must-have on Valentine's Day and these white chocolate hearts with gummy centers are a darn good homemade candy. Silicone heart molds help anyone to be a master chocolatier. The gummy candies are placed at the bottom of the mold and the melted white chocolate is pored over top. Once cooled and set, you can easily pop them out and enjoy the chocolate hearts by the dozen. Simple heart shape sugar cookies allow for tons of creativity in the kitchen. All you need is a batch of white royal icing and food pens in an assortment of colors. You can draw or write personalized messages to your Valentine. This is a great baking project to with the kids. Who needs a box of chocolates when you can have an entire cake. This exquisitely decorated cake is a project for experienced bakers or those who love a good challenge. A step by step tutorial for both the candy box and lid are included in the blog post.